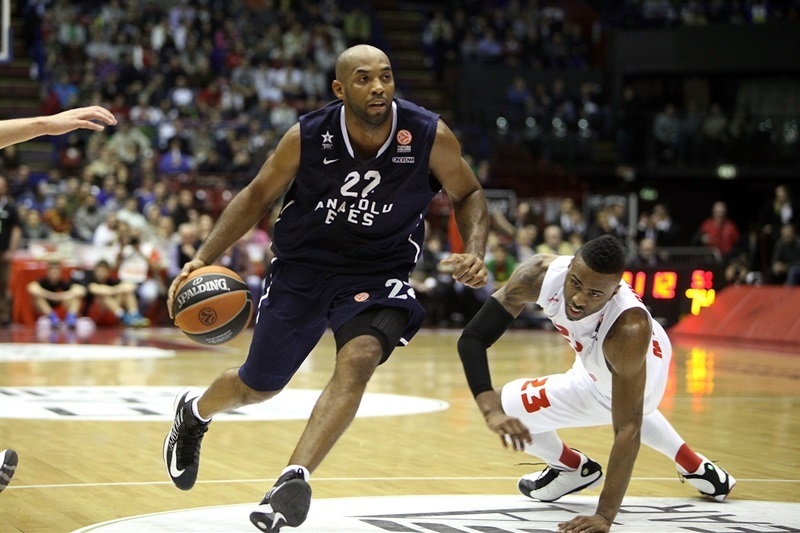 EA7 Emporio Armani Milan stormed back from a 14-point deficit to beat Anadolu Efes Istanbul 77-73 to take over second place in Group B of the Turkish Airlines Euroleague. Milan used a 17-0 run spanning the third and fourth quarters to improve to 4-2 in the group. 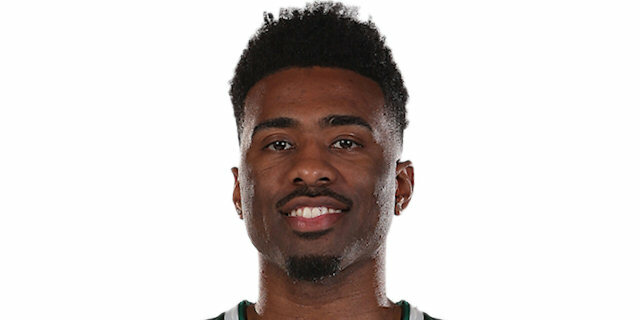 Keith Langford scored 15 of his 22 points in the fourth quarter for Milan, which scored the first 14 points of the fourth quarter, while Alessandro Gentile added 18 points and Samardo Samuels chipped in 12 points. Efes dropped to 3-3 in the group. Dusko Savanovic scored 14 points and Semih Erden collected 11 points and 12 rebounds in defeat. Kostas Vasileiadis and Jamon Lucas both added 12 points while Scotty Hopson scored 11 points. Milan coach Luca Banchi made one change to his starting lineup with David Moss coming on for Langford alongside Curtis Jerrells, Gentile, C.J. Wallace and Samuels. 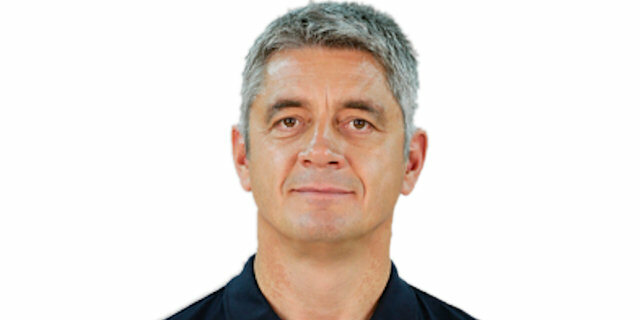 Efes boss Oktay Mahmuti brought back Hopson in place of Zoran Planinic in the starting five with Lucas, Vasileiadis, Savanovic and Erden. 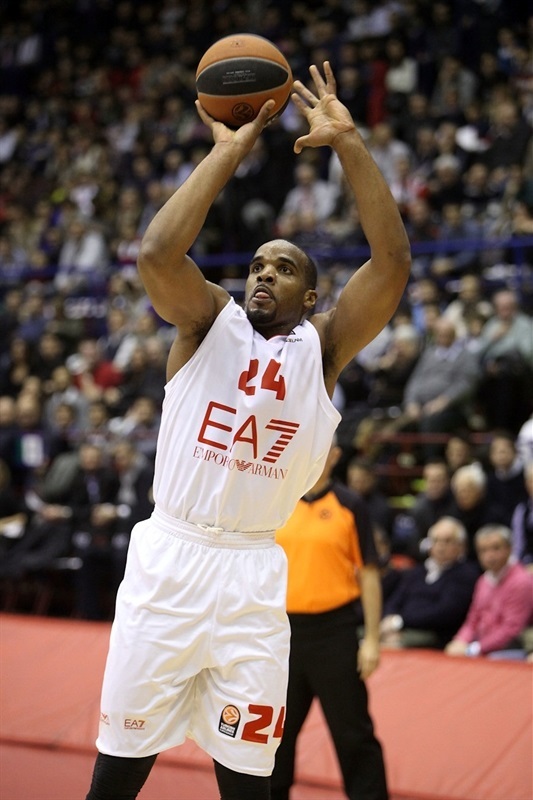 Samuels started the game with a dunk for the hosts and Savanovic came down at the other end for Efes’s first score. Samuels and Hopson swapped scores before a Moss triple for a 7-4 Milan lead. 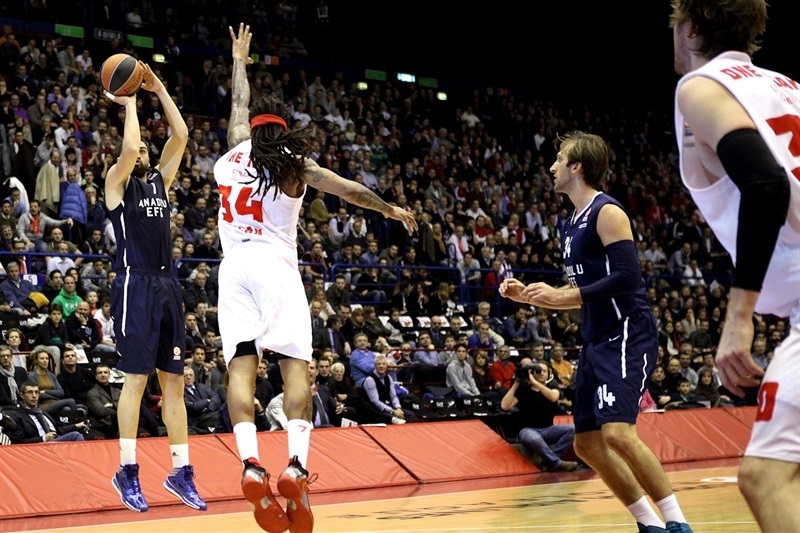 Savanovic completed a three-point play and Lucas gave Efes its first lead at 7-9. Gentile scored two straight baskets to give the hosts back the lead but Vasileiadis responded with a three-ball and Lucas’s jumper had the guests up 11-15. Gentile stopped the run with a dunk after a Jerrells steal, but Lucas drained back-to-back three-balls for a 13-21 Efes cushion. After it worked earlier in the quarter, Milan went back to Samuels and the big man scored on a dunk, a jumper and an inside move in an 8-0 run to knot the game at 21-21. Savanovic’s score had Efes up 21-23 after one quarter. 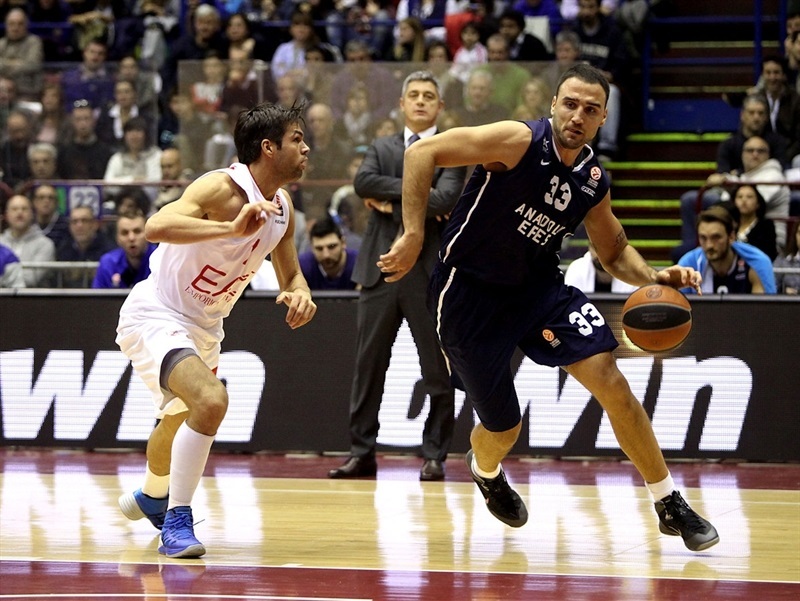 Stanko Barac opened the second quarter to push the Efes advantage to 21-25. After Gani Lawal split two free throws, Moss converted a three-point play to even the game at 25-25. Neither team could convert offensively for nearly three minutes until Tadija Dragicevic’s three-pointer for Efes. Marquez Haynes answered with a three-point play at the other end and Langford’s free throws had the hosts up 30-28. Erden picked up his play at this stage for Efes, posterizing Lawal with a dunk and three-point play and then added a tip-in and another flying dunk while Vasileiadis chipped in a three-ball in Anadolu Efes’s 2-13 close to the first half for a 32-41 lead at intermission. 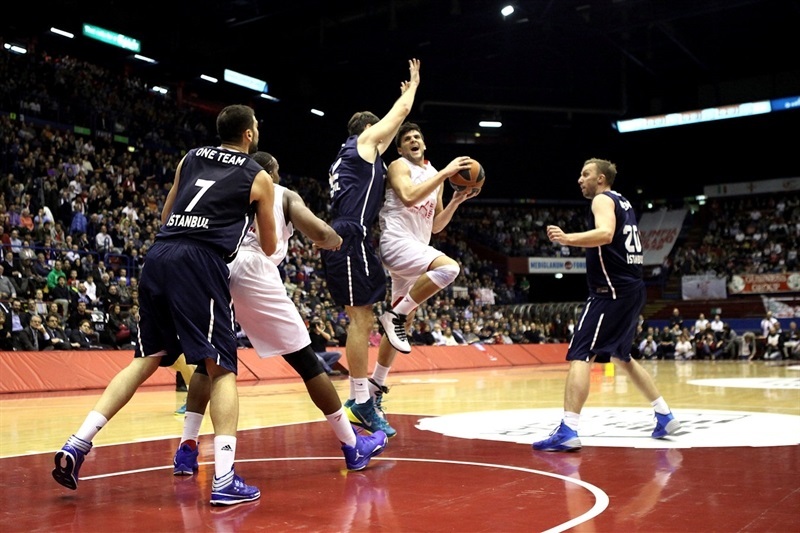 Nicolo Melli opened the second half with a tip-in and Gentile’s penetration basket got Milan to within 36-41. The Italian club went cold, going scoreless for two and a half minutes and watching as Efes got five points from Hopson in a 0-9 run for a 14-point lead 36-50. Gentile stopped the drought but Milan could not really cut into the deficit with Savanovic twice scoring to keep that 14-point margin. Gentile and Banchi were both hit with technical fouls and Vasileiadis made two free throws to make it 45-59. 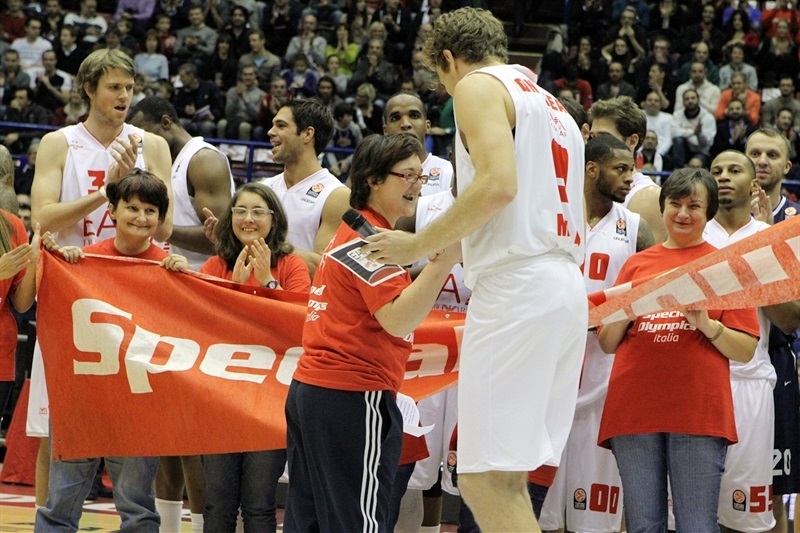 After Milan cut it to 48-59, Planinic nailed a triple for a 48-62 advantage. 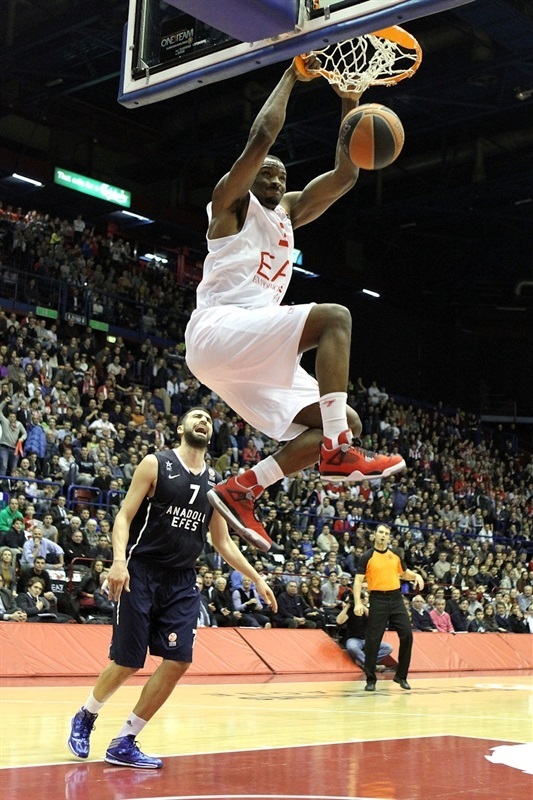 Langford converted a three-point play late in the third period as Milan trailed 51-62. The hosts came out for the fourth quarter like gangbusters. Langford drained a three-ball to start the comeback before Melli had steals and break away dunks on consecutive possessions and then Lawal threw down two dunks to knot the game at 62-62. Langford finished the 14-0 run to start the fourth with a three-ball for a 65-62 lead – giving Milan 17 straight points. After committing one turnover after the next in the first four minutes of the fourth quarter, Dragicevic finally got Efes on the board in the quarter with a trey to even it at 65-65. And Vasileiadis’s three-ball made it 65-68. Langford proved unstoppable though with two foul shots and a three-pointer for a 70-68 lead before Lawal’s dunk pushed the gap to 72-69. Erden’s two foul shots got it to within 72-71 but Langford made four more free throws for a 76-71 Milan lead with 21 seconds left. Lucas missed a jumper with 19 seconds left and Gentile made one foul shot with 10 seconds to play to ice the amazing comeback win. "It was a great victory for us, mainly how we got it and the great emotions we experienced during the game. We had a great start with good offensive balance. Then we started losing many balls, fueling their fast break. We respected our game plan until it was 25-25. In the last five or six minutes of the second quarter we showed our worst face, but we came back from the locker room with a different approach. 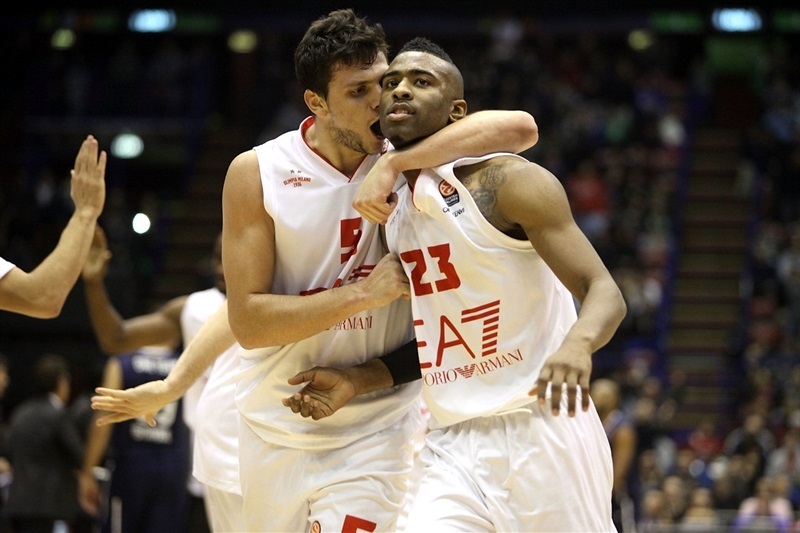 Gani Lawal and Keith Langford made a difference in the game with big plays, but I have to say that Nicolo Melli and Alessandro Gentile charged the team and the fans in the moment of our comeback. It's an important game to advance to the next round, and now we have to keep our fans with us. 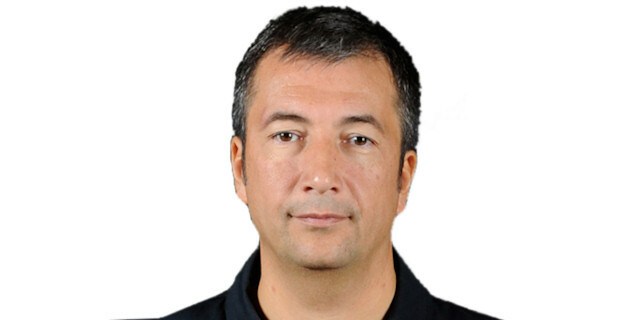 They helped us a lot, and now we have to follow on this way." "I think we deserved to win but we made bad mistakes in the crucial moments and were unable to react like the experienced team we are. We seemed to be a young team and not an experienced one. We made a lot of stupid mistakes and this is the main reason for our defeat." "Something changed in the last quarter, we were not afraid to lose the game, we made a great defensive effort, and improved our confidence, and our fans pushed us to take the win. It's very important on the way to advancing to the Top 16. We did not recover the margin we lost by in Istanbul, but it is a win and it will help us to look ahead with more confidence. " "It was a bad night for us, we lost a game we led for a big part; we made big mistakes early in the last quarter. After losing with a big margin in Madrid, we needed this victory, but we have to look ahead and think to the next game, because we need another win to advance to the next round."